Lionel Messi is constantly coming up with new ways of astonishing us on the football pitch – not least with his free-kicks for Barcelona this season. Since 2012-13, Messi has scored more direct free-kicks (24) than any player in Europe, nine ahead of his nearest challenge in Miralem Pjanic. The little magician has scored seven in all competitions this season alone, including three in consecutive La Liga matches over the past few weeks, and we’ve taken a closer look at each one. 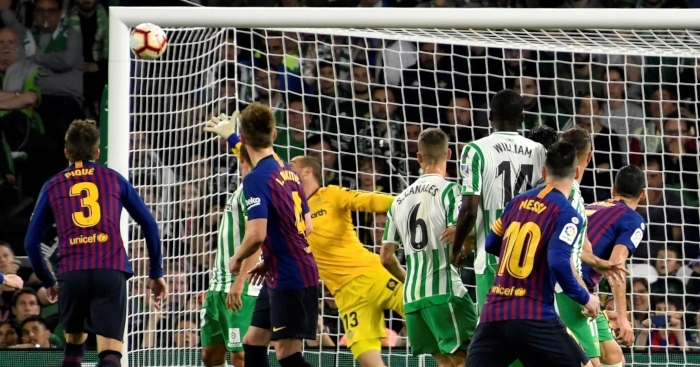 As if this wasn’t already brilliant enough, it was made all the better by the fact Messi had already hit the bar with an earlier effort over the wall, and so he decided to go under the wall with his next attempt. The frightening thing about Messi’s free-kicks is the sheer variety, yet the method remains the same: two steps, strike the ball with the instep, watch it sail into the back of the net. That’s actually quite far out to be made to look so routine. A brace of free-kicks, from either side of the pitch, in that pink kit. Glorious. Most goalkeepers position themselves towards the post not covered by the wall, taking the view that if a player gets the ball over the wall and under the bar on that side, fair play. With Messi, that’s a dangerous game, but Pau López did it anyway to make sure he wouldn’t get beaten on his side at least. But if Messi decides he wants to score on that side, he bloody well will do. Alfredo Morelos has been sent off three times against Aberdeen this season. Lionel Messi has scored three free-kicks against Espanyol this season. We don’t really understand how the two-step, instep thing can still generate such power, but fair f*cks, Leo.